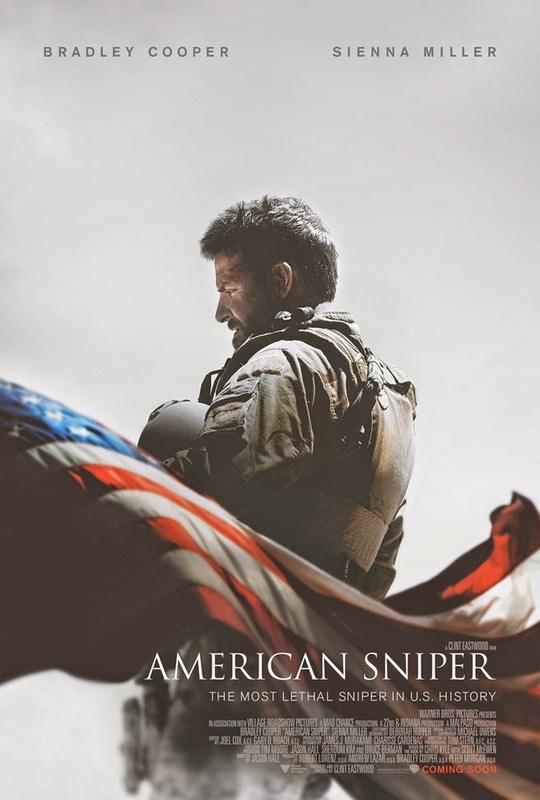 That line from Clint Eastwood’s Oscar-winning twilight western is never spoken in Eastwood’s latest film, AMERICAN SNIPER, but you can hear it reverberating inside the head of Navy SEAL sniper Chris Kyle from beginning to end. Because Kyle, who served four tours of duty in Iraq, racking up 160 confirmed kills, is a stoical type who internalizes his emotions, we never hear him actively comment on the toll his military-sanctioned killings may have taken on him. But it’s written loud and clear across the face of Bradley Cooper who embodies Kyle in an intensely physical, deeply empathetic performance. Death has consequences, and a human life is precious. Those sentiments have informed much of Eastwood’s directorial oeuvre, and have helped turn him into the American cinema’s Poet Laureate of screen mortality. The weight and substance of a life, and the irrevocability of death have rarely been as vividly portrayed or felt than in Eastwood masterpieces like UNFORGIVEN, MYSTIC RIVER, or MILLION DOLLAR BABY. SNIPER once again embraces those recurrent themes with the snub-nosed grace, unerring professionalism and mournfully elegiac tone one has come to expect from America’s greatest living classicist. It’s a great American movie by a great American filmmaker. Rather than traffic in hagiography, Eastwood unfussily presents Kyle as a good man forced to deal with the unimaginably brutal reality of combat on a 24/7 basis for the greater portion of his military career. The fact that his targets are “the bad guys” doesn’t make pulling the trigger any easier: you can feel the weight of his actions just by the way Kyle holds his rifle and the way his eyes narrow onto a target. “It’s a hell of a thing, killing a man” indeed. As astonishingly visceral and heart-poundingly intense as the Iraq scenes are, Eastwood’s greatest achievement may be in making the homefront scenes between Kyle and his family (Sienna Miller eloquently plays his wife, Taya) register as sharply and indelibly. They make their spousal connection so seemingly authentic—and with such a frisky intimacy to their early courtship scenes—that you’d swear they were really man and wife. Cooper and Miller did it for me in ways that Oscar front-runners Eddie Redmayne and Felicity Jones didn’t playing another true-life couple, Stephen and Jane Hawking, in THE THEORY OF EVERYTHING. This is screen acting of the highest caliber. Seeing the completed film, it’s hard to believe that Eastwood replaced Steven Spielberg as director a mere 15 days before the start of principal photography. The material, and the treatment, seem so utterly, unmistakably Eastwood-ian it seems inconceivable that another director (particularly one with as pronounced a filmmaking style and ethos as Spielberg) could have inaugurated the project. But that’s what the greatest directors in Hollywood’s Golden Age—the Fords and Hawks whose pantheon Eastwood surely deserves to be included in at this stage of his remarkable career—used to do all the time. The fact that Eastwood is 84 years old (an age at which both Ford and Hawks had long since retired) makes his achievement all the more prodigious and, quite frankly, awe-inspiring. Along with Kathryn Bigelow’s THE HURT LOCKER and ZERO DARK THIRTY, AMERICAN SNIPER is one of the few truly essential Iraq movies to date. I have a hunch that audiences will embrace it like no war movie since SAVING PRIVATE RYAN, and that, like Spielberg’s 1998 film, it will become a classic. It already feels like one to me.